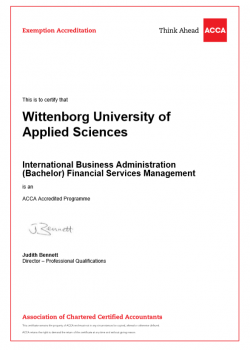 Wittenborg University of Applied Sciences has announced that its IBA (Bachelor) in Financial Services Management has now been accredited by ACCA – the Association of Chartered Certified Accountants – which is a global body for professional accountants. That means, students who wish to pursue a professional accountancy qualification after completing their IBA programme at Wittenborg will be able to do so via an accelerated ACCA-membership route as they will be exempted from taking Papers F1 – 4, as well as F9. Students who enrol will also enjoy other perks such as access to job placement opportunities, learning material and webinars. For Wittenborg it means providing additional value to the programme and a stamp of approval from the largest international accounting body. Consideration will also be given to extending the accreditation to other programmes like Wittenborg’s MBA in Finance. According to Enrique Sanchez-Monge, senior business development manager at ACCA Western Europe, the organisation has a presence in 180 countries, pointing out the accreditation’s relevance for the recruitment of students to the programmes in question. Sanchez-Monge was accompanied by the head of the Western European region, Abdul Goffar. Goffar said ACCA has lately been investing heavily in Europe given a 40% drop in some Northern American universities and the mood of uncertainty in the UK. "We see the Netherlands as a very attractive area to target." Goffar and Sanchez-Monge met with Wittenborg’s chair of the executive board, Peter Birdsall, Director Assistant, Lasantha De Silva, and the Head of the School of Business, Dr Rauf Abdul.